League1 Ontario presence in the end-of-year USports and CCAA awards is always substantial (check out the 2016 and 2017 editions, for example), but the year just past was an especially memorable one for male L1 players competing at the post-secondary level in Canada. 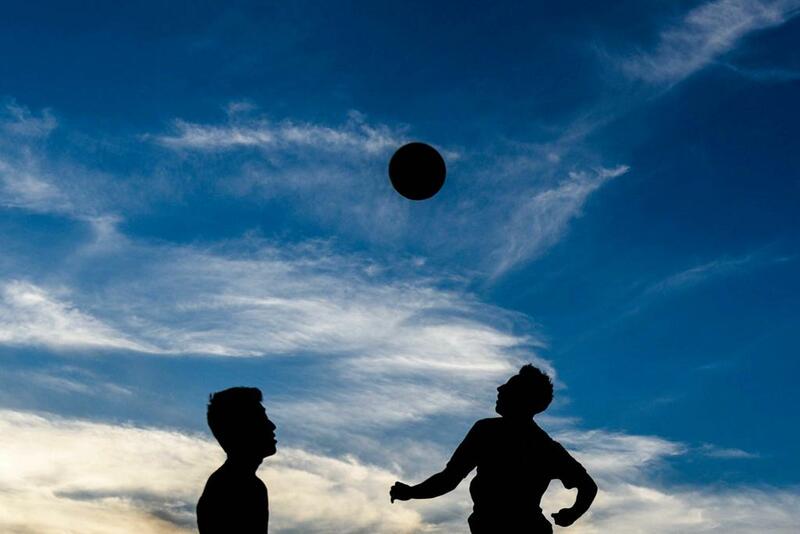 An inaugural draft for USports players led to six former L1 players being picked up the pros for the Canadian Premier League (CPL) after standout performances on the USports circuit. One of those was Vaughan Azzurri's Jace Kotsopolous, who earned both USports Player Of The Year and a First Round, Third Pick draft choice to Hamilton's Forge FC, following a standout year at University Of Guelph. Remarkably, Kotsopolous was just one of a pack of six former League1 players selected in the historic CPL/ USports draft. 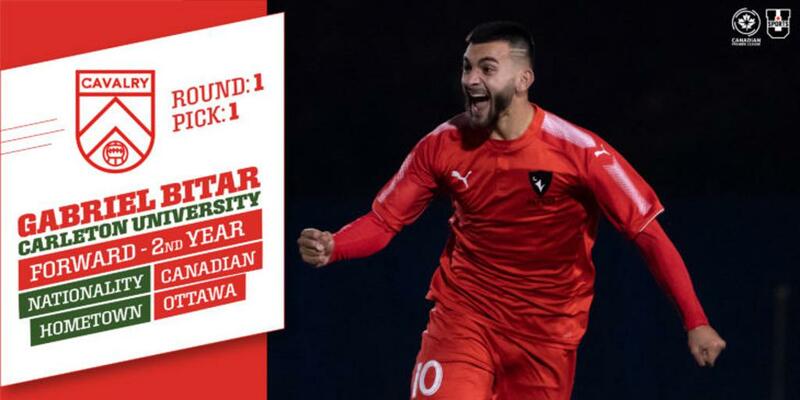 Ottawa South United's Gabriel Bitar was the First Round, First Overall draft pick to Calgary-based Cavalry FC after an impressive second season with the Carleton University Ravens. Bitar was named USports Rookie-Of-The-Year in 2017 and is a lightning quick forward with a natural scoring touch. Dylan Carriero - formerly of Vaughan Azzurri and Woodbridge Strikers in League1 - was the next pick in the draft, going Round 1, Second Overall to Winnipeg's Valour FC. Carriero went from York University Lions, where he played under his League1 club coach, Carmine Isacco. Carriero has professional background with established English club Queen's Park Rangers and Scotland's Dundee United and was always a top performer in the League1 environment. Following Kotsopoulos as the third pick in the draft, one of his Azzurri team-mates next showed up as the First Round, Fourth Overall choice. York Lions' Daniel Gogarty went to CPL club, York9, joining up with his club and university coach, Isacco, who had already been named the York9 assistant coach. 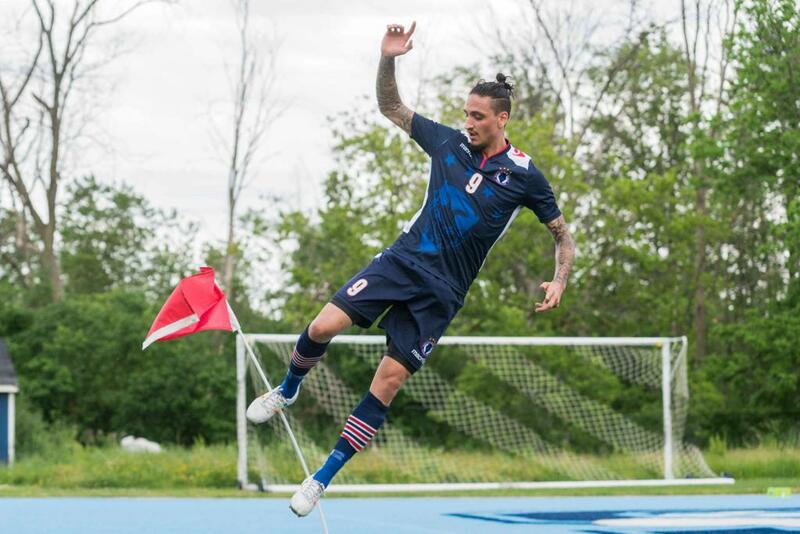 The League1 Ontario 2019 Champions, Vaughan Azzurri, were again in the news as Emmanuel Zambazis went in Round 2 as the 11th pick to York 9. Zambazis also lined up for Isacco at York University. Finally, TFC III product and University of Toronto Blues player, Marko Mandekic, was chosen Round 3, 17th pick by Hamilton's Forge FC. The big centre-back will have former Sigma FC head coach, Bobby Smyrniotis, as his boss at Forge FC - an individual that will know him well following epic battles between TFC and Sigma at League1 level. With his USports Player Of The Year honour, Jace Kotsopolous (University of Guelph/ Vaughan Azzurri) naturally led League1 representation at the USports level in 2018. 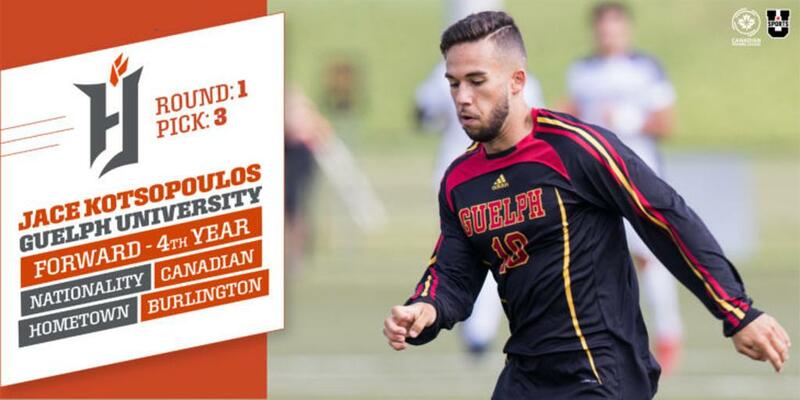 Kotsopolous was naturally named to the USports All-Canadian First Team as well, joining fellow League1 alumni Daniel Gogarty (York University/ Vaughan Azzurri) and Dario Conte (Carleton University/ Ottawa South United). Gabriel Bitar (Carleton University/ Ottawa South United) was named to the USports All-Canadian Second Team. On the college circuit, the Canadian College Athletics Association (CCAA) also had League1 representation at the top. The Humber Hawks men's team won the CCAA Gold Medal - their seventh title since 2012 - and featured 14 League1 players in their roster: Karman Saini (Oakville); Sebastian Zeballos (Masters); Riley Ferrazzo (TFC III); Michael Fayehun (Unionville); Aziah Reid (Woodbridge); Federico Leal (Woodbridge); Cody Green (Sigma); Armando Caracciolo (TFC III); Julian Mullin (North Miss); Tomasz Balicki (TFC III); Bradley Fenton (North Miss); Jordan Piccinin (Pro Stars); Luca Baldassarre (Woodbridge); Nick Frenati (Woodbridge). Karman Saini and Anthony Wright (Sheridan Bruins/ North Mississauga SC) were named CCAA Championship All-Stars. At the provincial level, League1 players received an impressive slew of honours. Longstanding Oakville Blue Devils' striker, Filipe Vilela, led the Ontario conference (OCAA) in scoring for George Brown College, and was nominated for CCAA Player Of The Year. Though he didn't end up getting the top award at Canadian College level, Vilela was named a CCAA All-Canadian and OCAA Player Of The Year. Bill Vyfschaft (Fanshawe/ FC London) took OCAA Rookie Of The Year as the outstanding young player in the provincial conference, an unsurprising development given his demonstrated quality in League1 for regular season table-toppers, FC London. 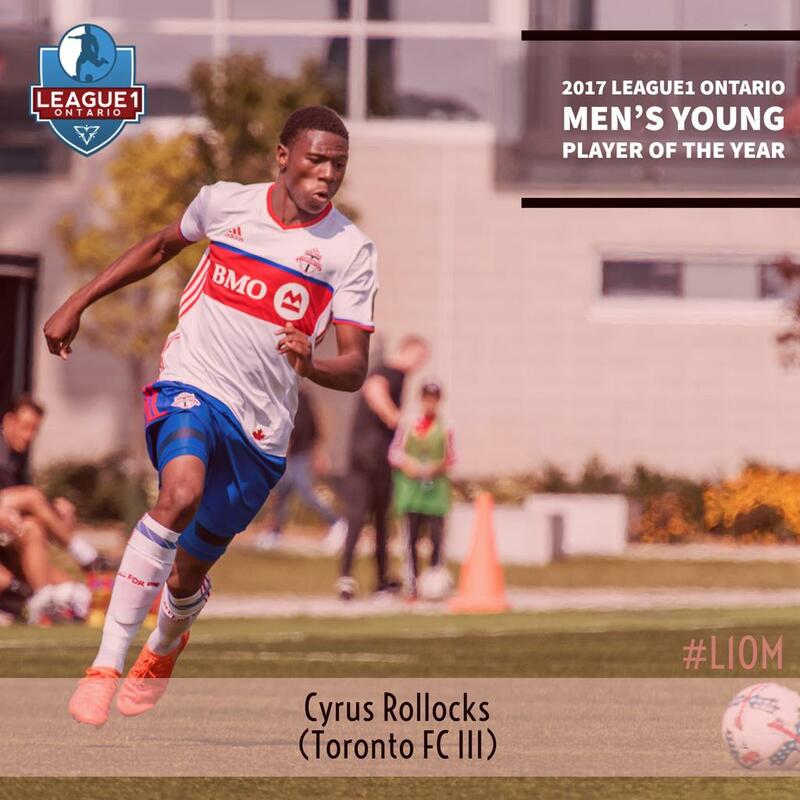 Two other League1 players received individual player honours at the OCAA level, with Cyrus Rollocks (Sheridan/ Masters) getting the OCAA Central Division Rookie Of The Year Award and Riley Ferrazzo (Humber/ TFC III) nailing down the OCAA Central Division Defensive Player of the Year Award.